I am pleased to announce the launch of a performer’s perspective, an interactive online documentary transmitting the dancer’s perspective and data in Judith Garay’s multimedia dance work, THE FINE LINE ~ twisted angels. This project has been in the works since 2015 and is the culmination of my PhD thesis research at the School of Interactive Arts + Technology at SFU. The overarching goal of this project is not only to translate and extend one’s perceptions of dance movement, but to explore how interaction and digital technology can be utilized to better communicate bodily knowledge to a broad audience. The design of the site is inspired by a close reading analysis I conducted of The Synchronous Objects website (published in the MOCO 2014 conference proceedings) and seeks to present the dancer’s data through three interactive categories: instructional, exploratory, and translational. The Instructional portion of the website includes each dancer’s verbal description of selected scenes from THE FINE LINE~twisted angels and short documentary videos related to the making of the THE FINE LINE ~twisted angels and each dancer’s perspective on their role in the work: Vanessa Goodman, Bevin Poole, and Antonio Somera. The Exploratory part of the website depicts the dancers’ movement data, collected with various motion sensors such as, the Myo armband and the Microsoft Kinect camera. In future versions of the site, this section will be expanded to include more options for viewers to interact with the data. The Translational section re-imagines the dancers’ data through varying artistic representations including music, animations, and visualizations. I am extremely grateful to the design/implementation team that has made the creation of this site possible including: Omid Alemi, Ethan Soutar-Rau, Theo Wong, Linda Nguyen, Professor Thecla Schiphorst, and the many other researchers that helped out along the way. Please see full credits here. I presented a paper at EVA London 2017 on VR, AI, dance, and performance. Our artwork, was also featured throughout the conference in the lobby. A full description of the work is published in the conference proceedings. I am so excited to share this project, which has been in the works for more than a year! This summer we plan to launch an interactive documentary that transmits the perspectives of three performers in Judith Garay’s multimedia dance work, The Fine Line ~ twisted angels. I have recently completed a video documentary that discusses more about our process of data collection for this project. Rehearsing for our interactive video artwork, “Fractured Perspectives: Movement and Light” that we will present in London this summer at EVA. Created in collaboration with prOphecy Sun, Steve DiPaola, and Reese Muntean. Photo courtesy of Steve DiPaola. I am so excited to present at the Body of Knowledge Conference at my alma mater, UC Irvine, on Thursday December 8, 2016. For a complete schedule of presentations and workshops see: http://sites.uci.edu/bok2016schedule/. Many cognitive scientists are turning to dance experts to explore the relationship between bodily knowledge and perception. Dancers have a unique skill set that integrates physical and expressive abilities, making them intriguing participants in studies that examine how the action observation network, action prediction, learning, memory, and aesthetic preferences are related to one’s physical experiences. While findings from these studies suggest that dance experts perceive movement differently than novices; the definitions of what constitutes a “dance expert” are far ranging, making it challenging to compare results across studies. 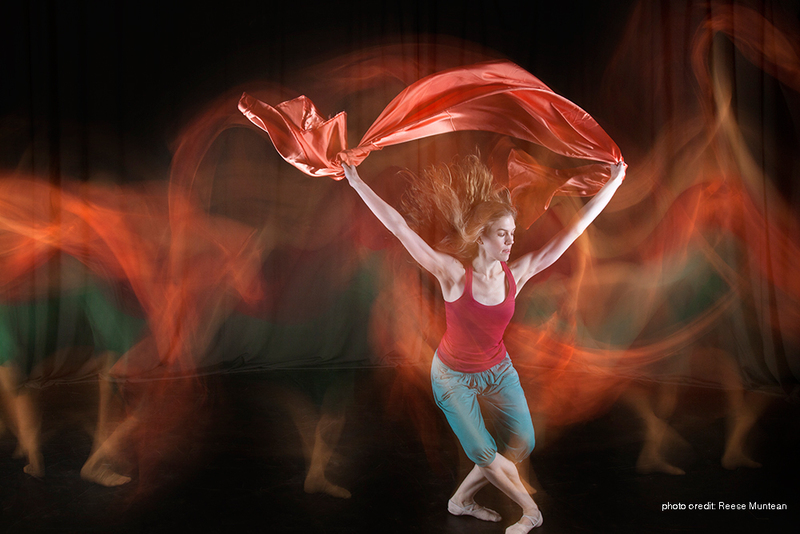 We discuss the variety of dance experts that are recruited for scientific studies in movement perception and draw upon research in dance education to form a richer definition of dance expertise. One possible way to parameterize expertise in dance is by role (e.g. performer, teacher) and style (e.g. ballet, hip-hop). However, the challenge in differentiating expertise by style or role is that many many dancers have trained in multiple styles of dance and commonly have overlapping roles–thus creating a knot of expertise. To untie this knot, we propose an enactive approach. Rather than label dancers as experts or novices based on an arbitrary requirement of the number of years a dancer has trained in a particular style or role, we suggest that broader categories of expertise will emerge from the data that go beyond both style and role. We predict four main types of expertise: Virtuosic, Expressive, Kinematic and Expressive expertise. Through combining methodologies such as psychometric measurement, eye tracking, brain imaging, phenomenological and analytical accounts of movement we can develop a more complete understanding of how expertise relates to the ways in which dance experts observe, learn, and articulate movement. This research can both inform the study of movement perception and help define gaps in dance education. Presenting my PhD dissertation proposal Thursday, November 3rd at 10am. The presentation is open to the public and will be held at SFU Surrey in room 2995. Photo by Reese Muntean. Pictured: Antonio Somera, Vanessa Goodman, and Bevin Poole in The Fine Line ~ twisted angels, choreographed by Judith Garay. Costume design by Margaret Jenkins. I am very excited to be leading a movement session at NDEO on Friday, October 7 2:15-3:15 in room Washington A. See below for a description of the session. What does it mean to be embodied? The idea of embodiment is widely discussed in cognitive science, philosophy, technology design, dance research, and somatic practices. In this movement workshop we discuss and physically explore various viewpoints on embodiment–as well as the possibility of disembodiment. Embodied Cognition is a theory that is becoming widely accepted in scientific communities. Its main premise is that cognitive processes do not only take place in the brain, but are shared between the body, brain and environment. Many scientists have turned to the dance community to study and validate this theory. For example, recent research suggests that our physical experiences influence how we perceive and observe movement. While this research is relevant to dance practice, it has not yet been fully integrated in teaching curriculums for dance. The intersection of cognitive science and dance is an emerging field of study that can inform ways in which we teach and learn dance. In this workshop I explore ways of transferring knowledge in cognitive science to dance practice. Through guided movement exercises, participants experience concepts such as, cognitive interference, theories of attention, and modes of learning. Through dance we can also explore bodily processes of cognition. In the last few years there has been a surge of government support in the United States to study the brain. However, as theories of embodied cognition gain traction in scientific domains, it becomes more apparent that it is difficult to study the brain without also studying the the role of the body. Integrating cognitive science research into dance curriculum ensures a future where dancers are not only participants in experiments, but also researchers that develop theories of cognition based on their bodily expertise and experiences. The future of researching embodiment cannot be studied in a jar. Embodiment must be experienced, moved, and danced. Taking part in the introductory training Dance for PD workshop with David Leventhal this weekend. I am extremely inspired by this work. It is so rewarding to see the power of dance, music, and the arts.